This Fractionated Coconut Oil is an all-natural carrier oil that readily absorbs into the skin, making it an ideal oil for topical application of essential oils. Feather-light emollient provides a soothing barrier without clogging pores. Ideal for combining with essential oils for topical therapies. pH balanced to work with all skin types, and is highly nourishing to the skin. Completely soluble with all essential oils; odorless, colorless, and will not stain or go rancid (does not require refrigeration). Use this oil as a light carrier oil for topical applications of pure essential oils, depending on skin sensitivity to the oils. It can also be used to calm sensitive skin reactions to essential oils by applying directly to affected area. This product is for topical use only. Essential oils need not be applied “neat” (or undiluted) for every use. One common mistake with essential oils is the assumption that more is better. It's actually quite the opposite: less is more with these powerful therapeutic grade healing oils. Pure essential oils are distilled from aromatic elements of plant life, including the leaves, flowers, bark, and roots. These essential elements have a concentrated aroma and never go rancid. However, most carrier oils (such as fractionated coconut oil) usually have minimal aroma and minimal color because they are pressed from the fatty portions of botanicals such as the nuts and seeds. Some carriers go rancid with time and therefore have a shorter shelf life. 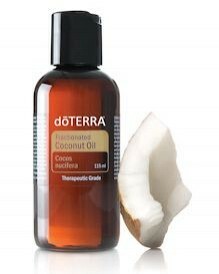 Fractionated coconut oil is a carrier that never goes rancid. It has an indefinite shelf life and is in a perfectly clear liquid form. Carrier oils are useful when working with essential oils because it is sometimes necessary to dilute a neat oil. One example is when applying to the skin. Powerful, highly concentrated essential oils may cause skin irritations. Another use for carrier oils blended with essential oils is to apply them during massage, as a needed lubricating agent when working larger areas and muscles. One advantage of carrier oils is that they do not evaporate like essential oils that tend to evaporate quicker when applied neat. Carrier oils actually aid in absorption. Incorporate fractionated coconut oil for massaging, making lotions, rubs, and creams for use on babies, children, elderly, and sensitive areas.